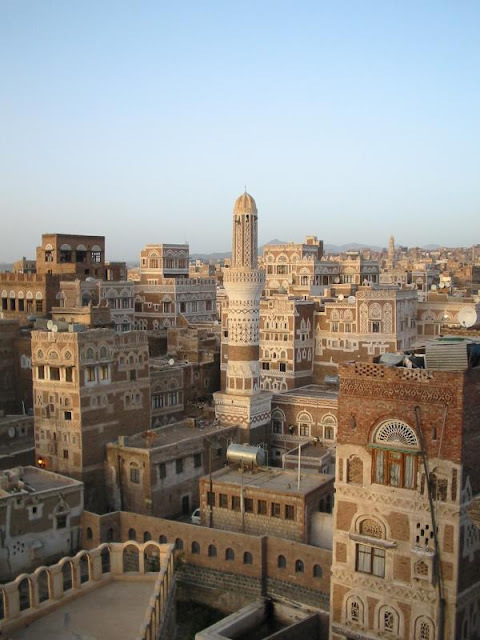 Yemen has been in the news a great deal recently – because of the civil unrest there. Yet little attention has been paid to the country itself – particularly its rich and surprising architectural heritage. So little known outside the country, this remarkable architecture has survived hundreds of years. 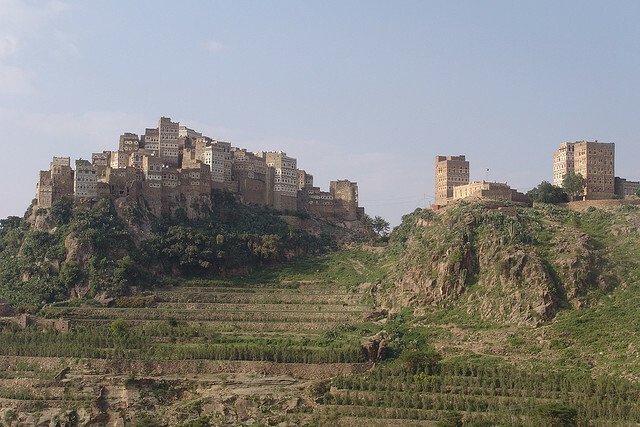 Take a look at the 'secret cities' of Yemen. 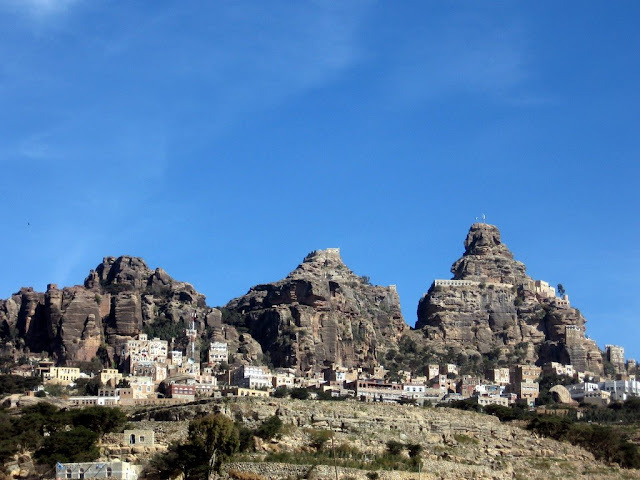 We will start in the town of Al Hajjara, so little known that even Wikipedia only has a tiny, recently added entry. 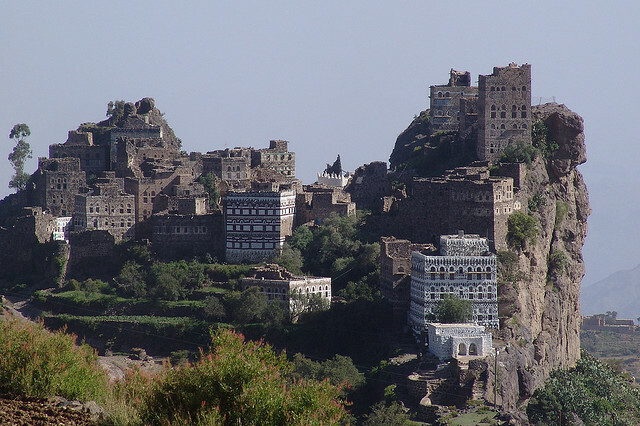 Situated at the heart of Yemen in the Al Bayda Governorate of the country, the town boasts one of the most unusually situated structures you will ever see. 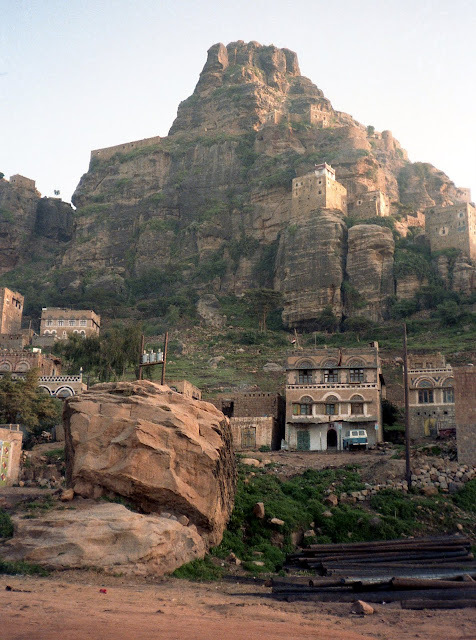 The residence of the Imam Yahya Muhamamd is perched – precariously or so it seems – atop a rocky outcrop. Imam Yahya was famous for stabilizing the north of the country and for his benign attitude towards minorities, particularly Yemenite Jewry. In order for his country to be recognized as independent he made many treaties, most notably the Ital-Yemeni Treaty of 1926 which gave Yemen full sovereignty. The country joined the United Nations in 1948 – a year before his death. The Imam's residence, grand and ornate belies the poverty in which many of the country's population exist. The country itself is just over half a million square kilometers. Although it is on the Arabian Peninsula many would not think of a country like this having islands but, in fact, Yemen has over two hundred (more of one later). It is the only republic in the area – and one of eight in total in the Arab World. It is thought that around twenty percent of the population live on just over one US dollar a day. It is, then, a poor country, but not one without its advantages. 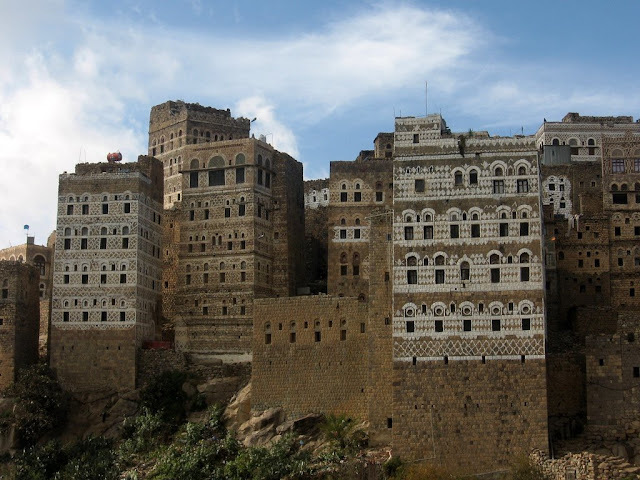 Perhaps surprising to western eyes, the town of Al Hajjara is one of multi-story building, hundreds of years old. Unexpected of course, but not if you consider that the town is built on a precipice of very limited square mileage. 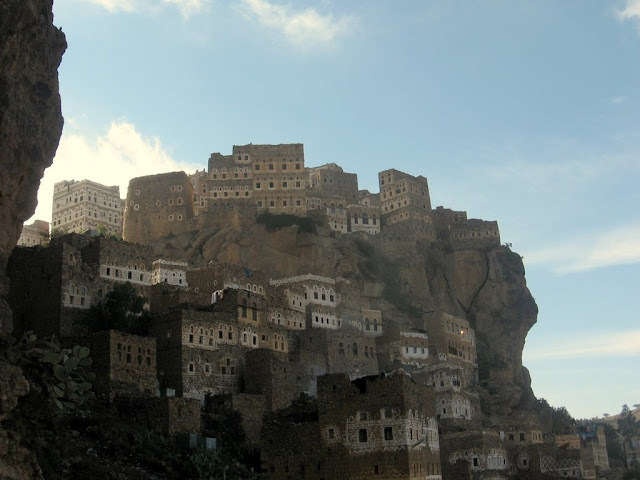 The only option was, indeed, up for the early Yemeni town planners. 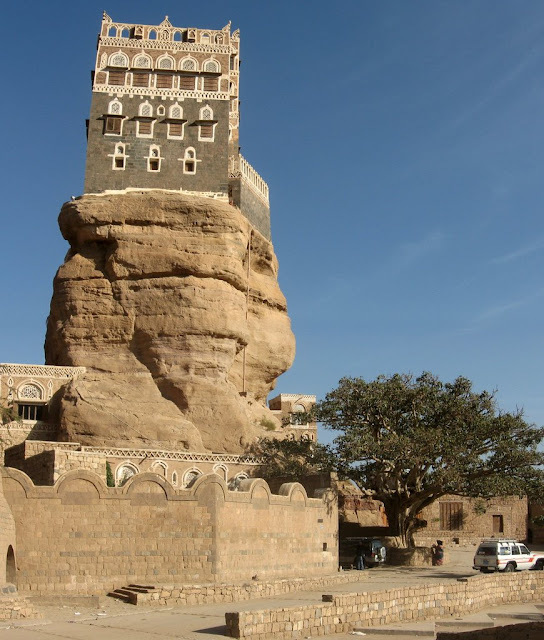 The huge care that was taken in decorating these towering structures indicates a sophisticated and advanced civilization – in fact, the oldest copy of the Qur'an has been found in this area. The engineering that must have gone in to the construction of these beautiful domiciles was advanced enough to easily rival that of Europe at the time. Many of the buildings are up to four hundred years old. A view from another angle gives us a direct look at the breath-taking achievement of architects hundreds of years ago. The town literally hangs off the cliff face. The title of this article may have been a little misleading, of course this and other towns are hardly a secret. 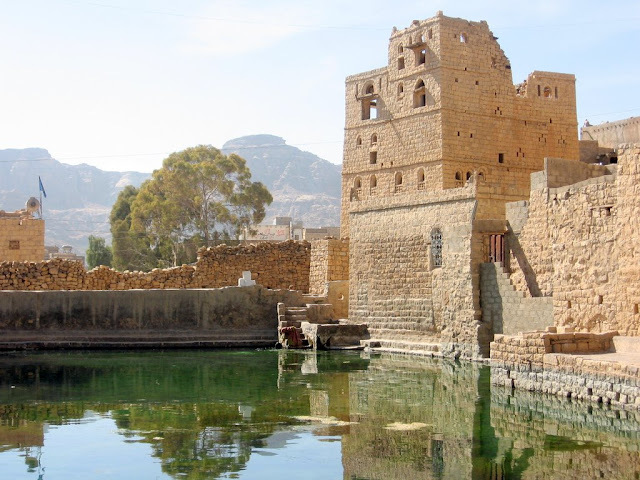 Yet Yemen and its history has so long been overlooked – or possibly even ignored – by Western countries and their media that to a greater extent that is how these places could easily be described. 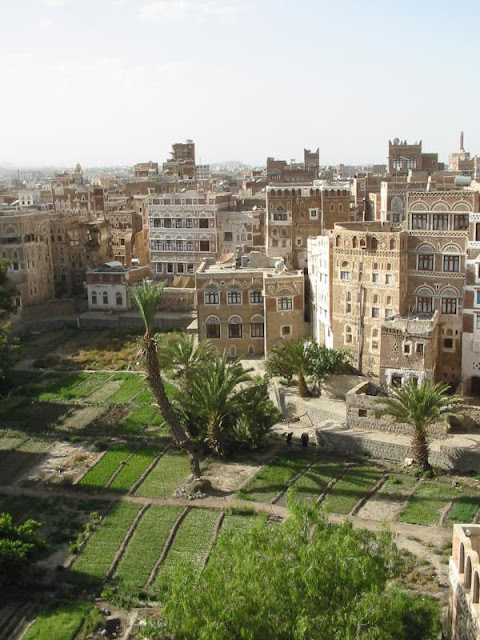 It looks idyllic, but the history of Yemen is far from that. Argued over by colonial powers (both European and Ottoman) for hundreds of years it took that long for it to gain its independence and emerge as a sovereign power in its own right. It was not until 1990 that two separate Yemens – North and South came together to form a single country. Elections over the last ten years have only been judged by international observers to be 'partly free'. The Parliamentary elections in 2003, however, saw a marked decrease in the amount of fraud and political violence than in previous years. 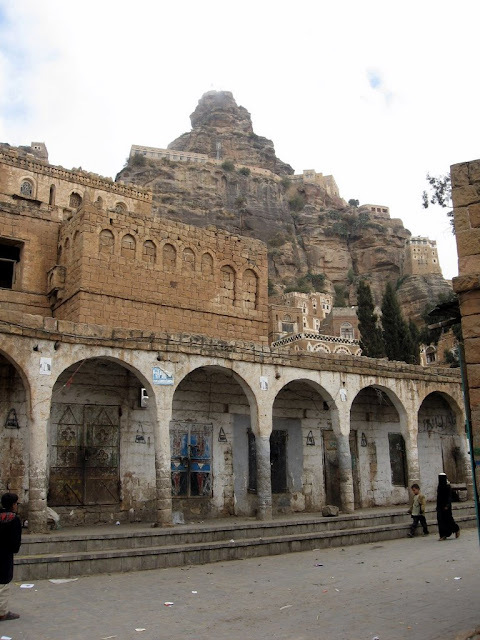 Sana'a is the capital city of Yemen and has a population of just under two million people. Not a large city by global standard but one which holds a marvellous secret. 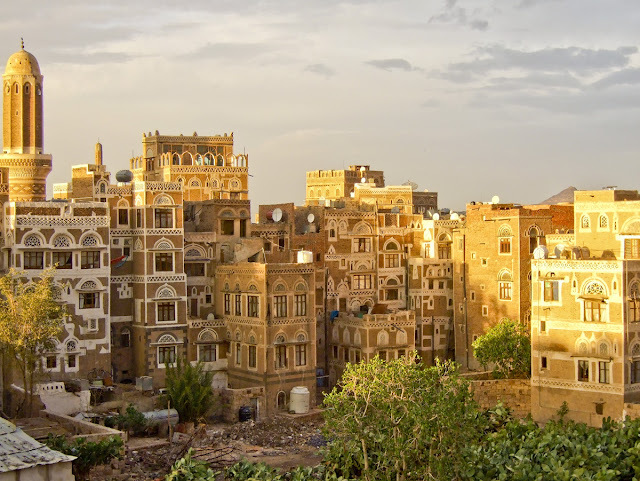 The old city – or Old Sana'a as it is called is a hidden jewel of exquisite centuries old architecture that simply has to be seen to be believed. 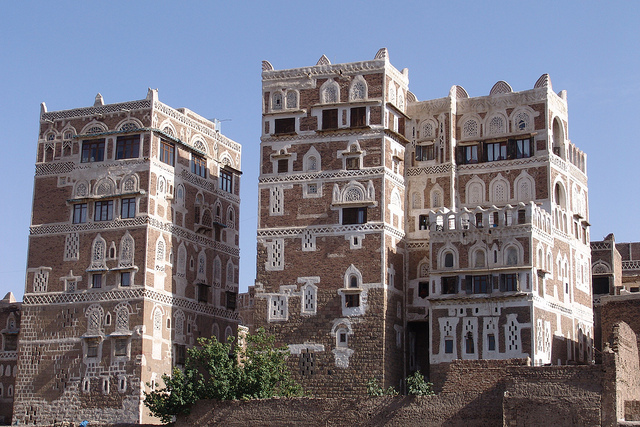 The Yemeni inclination towards multi-story building persists here. Many of the buildings date back over four hundred years when European architects were still struggling to construct buildings with more than two storeys. The buildings remain as they were when they were built although the addition of satellite dishes give a clue as to the more modern inclinations of their inhabitants. The gardens of Sana'a are lush and verdant. It says a lot about the ability of the inhabitants to conserve water and use it to its fullest. Half the rain of the year falls between July and August. 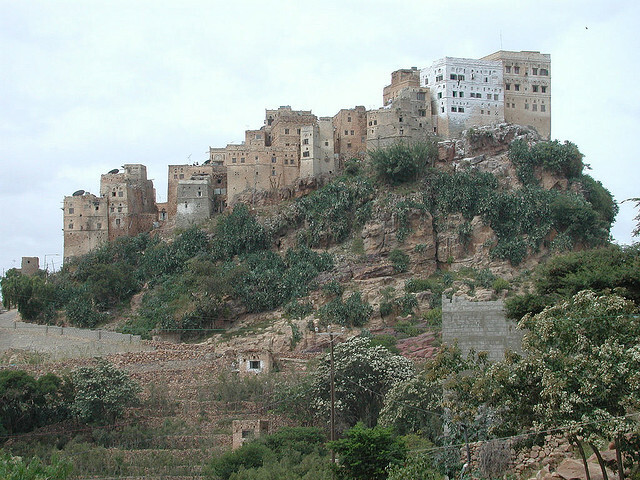 Sana'a has a very rare climate – a mild version of that of the desert. It has around twenty centimeters of rain each year but due to it being high up the temperature is much milder than many others on the Arabian Peninsula – and the city is lucky enough to rarely experience extreme heat or cold. No wonder the city was built where it is. 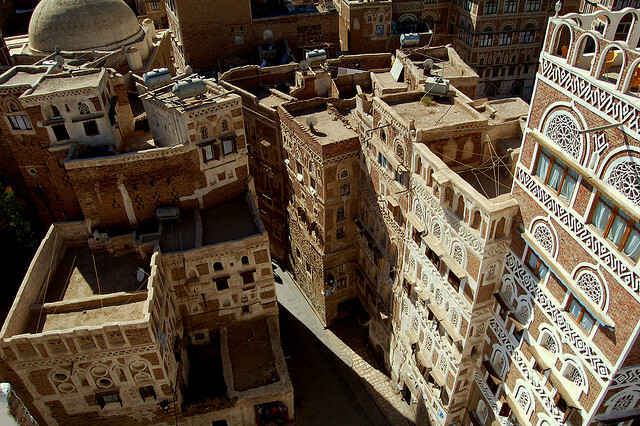 Sana'a must be seen to be believed. These were the words of Imam Muhammed ibn Idris al-Shafii in the ninth century and the same is true today. It is renowned for its delicious food as well as its architecture. Initially the traveller can find the city confusing as it is like a maze – or even a labyrinth. However, the city allows travellers to immerse themselves in the full experience of a city hardly touched by Western ways and habits. 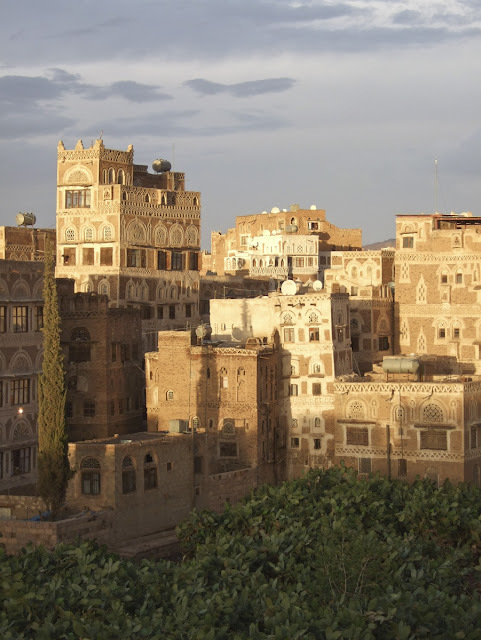 From the ornate and beautiful scripts adorning the buildings to the markets which still operate in age-old ways, Sana'a retains its traditions intact while still acknowledging modernity. This village is astonishingly high up at 2300 meters and it just seems to get higher. The economy of the country depends on the revenues it receives from its vast oil fields. 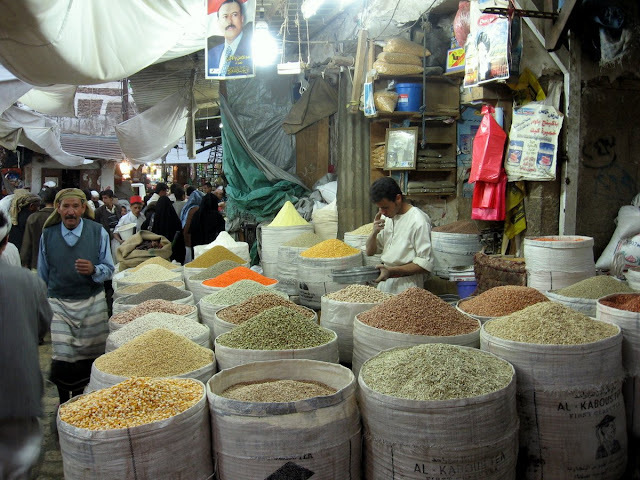 However, these are expected to be depleted by the year 2017 and then, perhaps, the Yemenis may find themselves in a position where they have to market themselves – as well as their unique architecture – in order to survive. The country is not visited by many tourists and this could well be the way to the future. Certainly, the landscape and the architecture combine to give the visitor a set of unforgettable memories. The three cities featured here are by no means the only centers of population which should be considered when visiting the country. As custom dictates, by midday when the sun is almost unbearable everything – including the market – closes down in the village. The shops will reopen later when it is cooler. The country generally needs to be re-imagined by many, who, having heard of it as a hotbed of terrorism see it as a hive of training camps and munitions hording. The country has a unique history and architecture which must not be undervalued. A final reason that Yemen should be of more interest is a unique archipelago there. Socotra consists of four islands and the fact that it has been isolated of the Horn of Africa for so long means that over a third of its plant life is found nowhere else on the planet. Those who visit the place say that it is a completely other worldly experience. 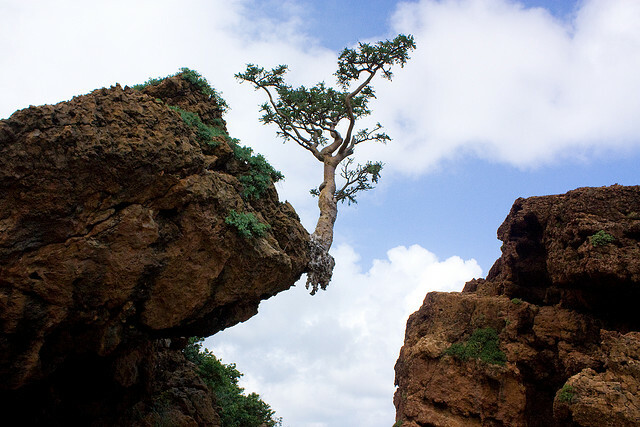 Nothing weirder than the dragon tree that is found on this archipelago. 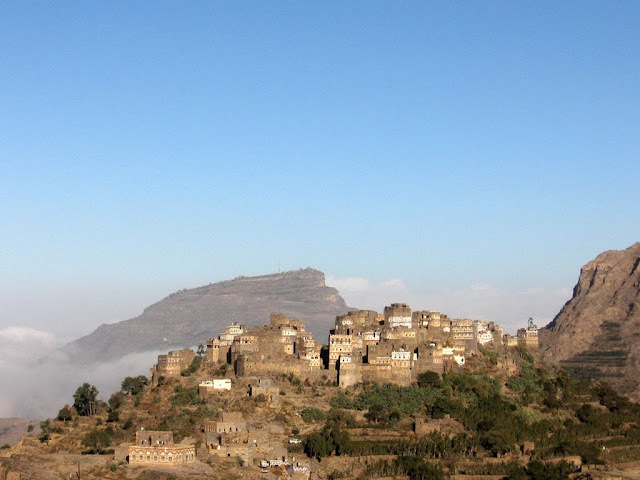 Eco tourism has not taken off in Yemen but it seems that it may only be a matter of time.